How to roast asparagus in the oven? 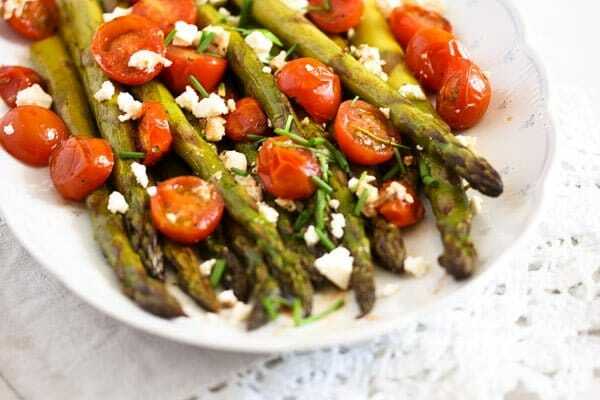 An easy and quick recipe for oven roasted asparagus with tomatoes, balsamic vinegar and feta cheese. Only 15 minutes in the oven. This is a repost from May 2016. 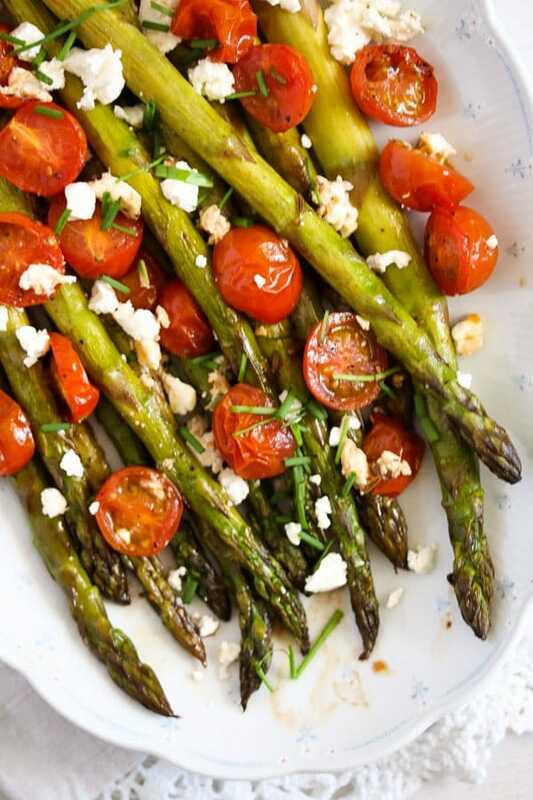 Oven baked asparagus and cherry tomatoes with fennel seeds, topped with feta and dressed with olive oil and balsamic vinegar, it can hardly get any better when it comes to asparagus. Only a few ingredients and very little work, but the resulting dish is worth being served at a dinner party. Or any other time during the short asparagus season, I found this dish to be so good that I keep making it over and over again. 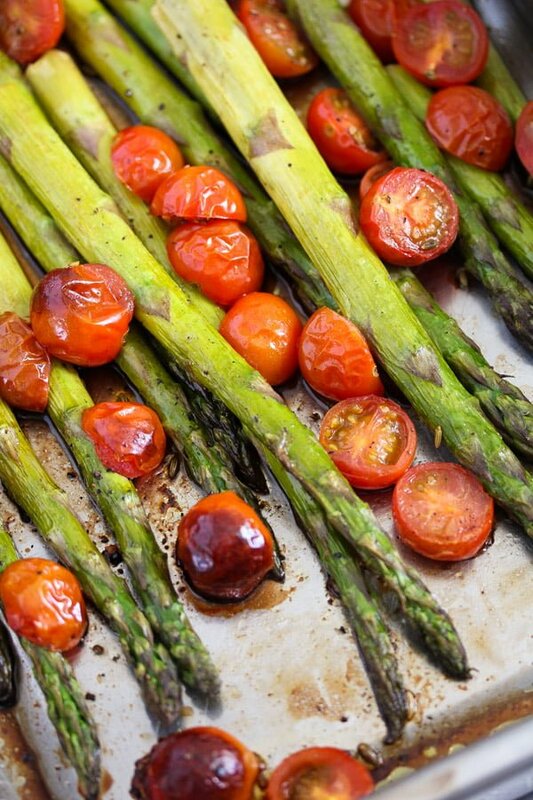 This oven roasted asparagus with cherry tomatoes makes an ideal dinner when you want to have something really exquisite, but don’t feel like being long in the kitchen. Of course, you will still have to make some sandwiches for the kids – I dare you to name me a kid who would eat asparagus, I’ve never heard of one until now – but otherwise just mix all the ingredients together on a baking tray and put the tray in the oven for about 15 minutes. In my last post White Asparagus with Sauce Hollandaise and Ham I mentioned some of the differences between the white and the green asparagus. So basically, they are quite the same, white asparagus being grown under the earth while green asparagus grows in the sun, thus developing the green color. The fact that it grows above the ground makes it not only green, but also healthier than the white asparagus. I mean, they are both healthy, see this post for Asparagus Salad with Hard-Boiled Eggs and Ham for more on the health benefits of asparagus, but the green asparagus has more vitamins and minerals than the white sort. I found out that the botanical name of asparagus is Asparagus officinalis, which translated from Latin means nothing else than remedy or medicine. It seems that the Romans recognized long ago the health benefits of asparagus. 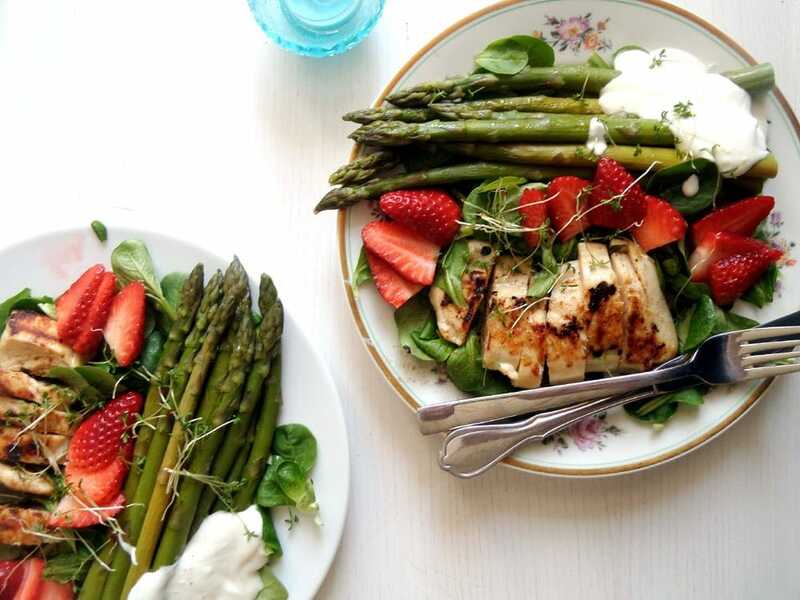 Asparagus is a natural diuretic and thus recommended for people who tend to retain water in their body’s tissues – I used to eat a lot of it while I was pregnant, especially during the first pregnancy, my feet were the size of baby elephants. Actually that was actually the first time that I ate asparagus (I only knew it by name during my childhood), I was desperate about my swollen and aching feet and searched for advice online. I read about the benefits of asparagus, so during that pregnancy spring I ate tones of asparagus and rice, which also seems to help against water accumulation. 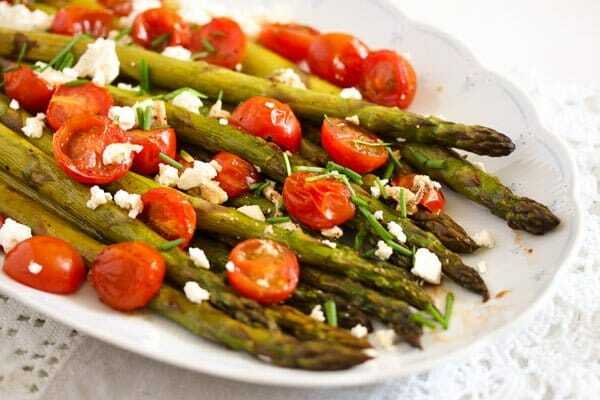 Also asparagus is full of anti-oxidants and this, according to new research, might help slow the aging process. And it seems that asparagus might also help fight some forms of cancer as well. So keep eating asparagus, the season is short, the taste amazing and the benefits huge. This couldn’t be easier. 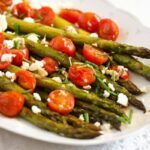 If you decide to make this recipe for Roasted Asparagus Recipe with Tomatoes and Feta you will only need 5 minutes to prepare and dress the asparagus and the tomatoes and 15 minutes to roast the vegetables. Isn’t that wonderful? Make sure the oven has time to preheat while you prepare the veggies, give everything on a baking tray lined with baking paper. If you use baking paper you will not even have to wash the baking tray afterward, just discard the paper. Roast the asparagus and the tomatoes in the oven for 12-15 minutes, depending on the thickness of the asparagus stems, when done the asparagus should still be firm to the bite or al dente (you don’t want it to get too mushy) and the tomatoes should be wrinkly and slightly caramelized. Oh, how I love this dish, give it a try, I am sure you will love it too. As I have mentioned before this is a repost from 2016. I have been making this recipe over the last two years repeatedly without changing one thing. However, this spring I decided to add a good pinch of fennel seeds to the dish. It was amazing! The fennel seeds brings the dish to a whole new level, giving it a slightly sweet flavor which fits the rest of the dish brilliantly. It is optional, of course, but if you like fennel, do give it a try! Preheat the oven to 200 degrees Celsius/ 400 degrees Fahrenheit. Line a baking tray or roasting tin with baking paper, if desired. Remove the woody, lower third of the asparagus stalks. Halve the cherry tomatoes. Place both vegetables on the baking tray, add the fennel seeds, oil, vinegar, salt and pepper to taste. Mix well with your hands. Place the tray in the oven and bake for about 12-15 minutes or until the asparagus is done to your liking. It should still be firm to the bite. Crumble the feta over the vegetables in the tray and serve immediately. Is there anything better than asparagus season? Love it so much = and this version looks perfect! Had some roasted green asparagus yesterday too. Need to get more! Asparagus is my favorite spring vegetable! I just eat it and eat it and eat it while it’s in season so I can get my fill before it’s gone… helps tide me over to the next year. I love this simple but scrumptious pairing with tomatoes and feta – sometimes you don’t have to do much to really make veggies shine! I think the same, some things must be kept simple. 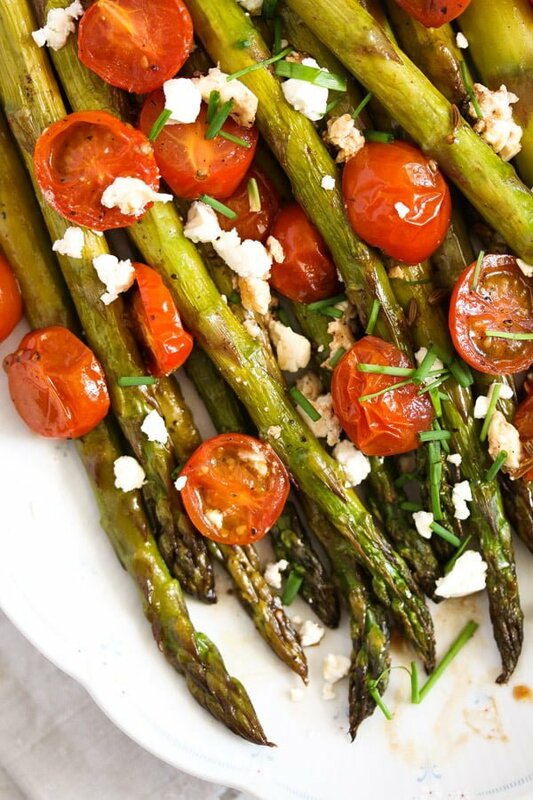 I can not get enough asparagus this time of year, especially when it is simple and roasted, so this looks perfect to me! Love the addition of tomatoes and feta! Cheers! Thank you, Cheyanne.It is the same for me with asparagus. My favorite way to eat asparagus is roasted, so I love this! With all the health benefits, it is all the more reason to have it often. The feta is a great way to punch up the flavor even more. I have to try it! I love asparagus everything especially roasted. What a healthy yet full of color and flavor dish, Adina! 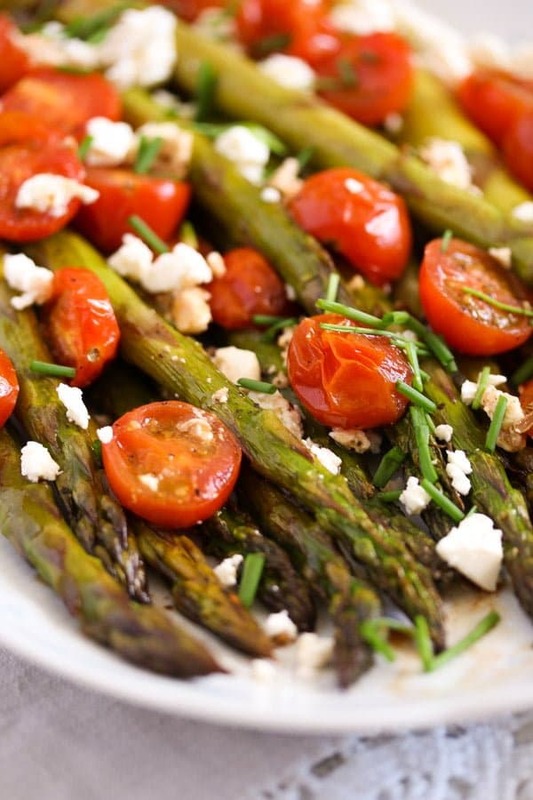 Everyone loves roasted asparagus — I guess they are so much in trend these days! 🙂 Love how beautifully you have paired them with tomatoes and feta. WOW! your asparaguses look terrific! So healthy and yummy! I love using fresh asparagus when it is available. Roasting it is such a great idea. I’m always amazed by the nutritional value and other benefits that come from natural ingredients! No need to visit the drug store….just go to the produce section! I love asparagus. The idea of paring it with tomatoes and feta is great. The balsamic must give such a lovely flavour. It looks fantastic! I almost always have all the ingredients during the asparagus season, so I can try it even next week. Thank you for inspiration!